ELECTRIC TOPRAIL TELPHERS are overhead travelling cranes generally used for the handling of materials such as coal or coke. Such a crane consists of a grab depending from a bogie which travels along an elevated rail supported by columns at intervals. These two telphers at Moredon Power Station, which belongs to the Corporation of Swindon, Wilts, are fitted with three-rope grabs of 3-tons capacity. The rail is 53 feet above the ground. THERE is no form of engineering that does not entail the use of cranes in some form or other. Cranes, or the winches and hoists from which they have developed, have been evolved over a period of thousands of years. There are hundreds of different types of crane in use to-day, and in each group arc yet further differences in size, capacity and sphere of usefulness. The range of machines covers all types from the warehouse crane, with its hook and iron ball poised perilously over the pavement, to the giant machine-shop traveller that can pick up a completed locomotive, carry it over the tops of other locomotives under construction, and then drop its load on the track that leads to service on the steel highway. There are little cranes that load great shells into gaping gun breeches, tall cranes that lift stone and steel from lorries in the street and raise block or girder aloft to add to some great building. Cranes at the wharf side handle our daily food, and in the shipyards tower the massive machines without which liners and battleships could not be built. There are so many different types of crane which closely resemble machines known by other names that a definition may prove useful. Briefly, a crane is a machine for moving loads of any kind in a vertical and horizontal direction. There are other devices that do not come strictly within the crane category, but have similar functions and are often incorporated in crane design. These include winches, hoists and crabs. A winch has a hand-operated or power-operated drum that works indirectly by raising or lowering the load through chains or ropes. Winches generally comprise a drum, driven by hand, steam or electricity, through the medium of a “train” of toothed wheels. A winch, however, in some form or other is an integral part of any crane. One of the oldest of winches, known as the Chinese windlass, dates back for thousands of years. This ingenious device dispenses with gearing and consists of two drums, one large, the other small, fixed side by side on a shaft. To either drum is attached the end of a rope, doubled on itself, that passes through a pulley block carrying the load. To raise the load, a handle on the windlass shaft is turned so that one end of the rope is wound upon the large diameter of the double drum. On the smaller diameter the other end of the rope has previously been coiled and this now unwinds. The large drum winds in faster than the small drum pays out, so the rope and the pulley block with its load slowly rise. This difference in diameter enables the available power to raise a heavier load, although more slowly, than would be possible with a plain drum windlass having only a single rope. Among winches there are many different types - some fixed, others capable of being moved on wheels or rollers. Probably the best-known hand winches are those used for hauling boats up the beaches of seaside resorts. Such winches are geared and are generally fitted with a pawl and ratchet to prevent the rope and load from running away when the driving handles are released. The ratchet and pawl device is also found in hand-operated cranes and will be recognized as the driving mechanism found in the free wheel of a bicycle or in the winding apparatus of an alarm clock. Among power-driven winches those found on board ship serve as outstanding examples of their kind. Worked by steam or electricity, marine winches are used in conjunction with derricks for the handling of cargo. With cranes, however, the movable type of winch, or travelling crab, is of most importance. Travelling crabs allow a simultaneous lifting and travel of the load on a crane cantilever or arm or on the main girders of a travelling crane. Either hand or electrical power can be used for moving the crab or for lifting the load. The small hand-operated crabs and those of medium size worked electrically are a familiar sight in the neighbourhood of a printing works. A lorry, heavily laden with reels of paper, will draw in to the roadside. Out from the first floor level of the printing works there shoots a long steel girder. The crab comes gliding along the girder, slings are adjusted round the reel and five miles of paper disappear into the basement of the building on the way to the printing presses. Hoists are not strictly definable as cranes, but they are similar in their work. The term hoist is generally accepted to refer to machines that operate vertically only. Hoists comprise an enormous range of machines, from the hand-operated hoist that handles dishes in a restaurant to the mighty multiple-decked cages that fly ceaselessly up and down the deep shafts of coal pits, hanging on strong steel cables that derive their power from giant winding engines. The engines of these hoists are steam or electric, and in the engine-rooms are indicators that show the exact position of the cages at any moment. The hoists that link higher and lower levels within the pits are driven by electricity or by engines worked by compressed air. Other types of hoist are used by contractors and builders for the handling of materials and skips loaded with mixed concrete. These builders’ hoists are driven by electric motors, petrol engines or diesel engines. THE LEVEL-LUFFING JIB CRANE at Durban, South Africa, is one of the largest cranes of its type yet built. The crane has a maximum lifting capacity of 80 tons at a radius of 62 ft 6-in. The four legs of the crane are supported on four-wheeled bogies running on a double track. The crane can slew round through a complete circle in three minutes. It is shown just before raising its test load of 100 tons. Cranes may be divided into two classes - fixed and travelling jib cranes and fixed platform cranes. Either class comprises a number of different types, and in many cranes the characteristics of two or more types are combined. The simplest type of jib crane consists of a winch mounted on a vertical column or a turntable, with a jib of timber or girderwork that projects upwards. The lifting and lowering of loads is done by the winch and cable. The swinging or “slewing” of the jib from side to side is generally accomplished by a gear wheel that engages with a large toothed wheel interposed between the crane framework and the foundations. The jib is generally given another movement to alter its inclination to the crane post. The jib is pivoted at the bottom so that its top describes an arc of a circle when in motion. This action is known as “luffing”, and in large cranes special gear is used to prevent vertical movement of the load while it is being traversed horizontally by the luffing of the jib. The compensating gear automatically pays out the lifting cable as the luffing of the jib tends to raise the load. Among simpler jib cranes are those that are found in the goods yards of almost every wayside railway station. For the transfer of merchandise from railway wagons to road vehicles this type of hand crane is a cheap and serviceable labour-saver. Another type of crane, more familiar to the town dweller, is the wall crane That is a necessary part of the equipment of every warehouse. Generally the wall crane comprises a vertical pillar, pivoted at either end. At the bottom of the pillar is a fixed or pivoted jib; the hoisting mechanism is in the form of a winch inside the warehouse. The driving gear may be worked by an electric motor or by hand. A somewhat similar crane for use inside a building is the foundry crane, but in this instance the jib is horizontal and consists of a pair of steel girders on which runs a travelling crab. The crab, comprising a geared winch on a light “truck”, is either electric or hand worked. Foundry cranes of this type, as their name implies, are primarily used in foundries, but their range is rather limited and large foundries now use big overhead travelling cranes. A special feature of large foundry cranes is the provision of “creeping” gear that enables the crab to withdraw a pattern slowly from the casting mould without disturbing the sand impression that is to receive the molten metal. It is in the open air, away from the confines of narrow city streets, that the jib crane displays its capabilities in size and power. Jibs are sometimes 100 feet in length. Surmounting huge triple towers of steel that overtop surrounding buildings, the giants among cranes stand stark against the sky. There are few more impressive sights than a contractor’s crane at work. The great jib swings swiftly and silently as it raises aloft the immense steel girders and blocks of masonry, depositing them in their allotted places with uncanny skill and precision. On the largest building cranes a separate electric motor is used for each of the movements - slewing, luffing and hoisting. These movements can be carried out simultaneously. Cranes used in the construction of modern steel and concrete buildings are generally of the jib type, erected on three temporary steel towers built adjacent to or on the site. The crane comprises a central post that rises from a platform carrying the driving cabin and jib. With the crane mounted on top of one tower, two huge booms connect the top of the central post with the tops of the other two towers, the tops of the three towers being connected by a triangular bracing. This arrangement provides a safe, yet comparatively light construction, and it is used also in a simpler form, at ground level, for handling materials in builders’ and manufacturers’ yards. The type of jib crane that is used probably more than any other is the wharf crane for loading and unloading ships. There is one point about many of these wharf and dock cranes that must have been noticed by most people. The crane jibs have at the upper end a folding lever with an action reminiscent of a pointing finger. It is the automatic action of the folding lever that keeps the load at a constant level while the jib is being luffed. Before the introduction of this device, the action of raising a jib to shorten the radius was inevitably accompanied by a lifting of the load. Thus much power was expended and the speed was necessarily kept low. But the power demanded by the level luffing gear as compared with the gear formerly used is somewhat similar to that necessary for rolling a railway truck on rails as compared with that required for lifting it from the rails. This luffing gear is found on Babcock and Wilcox jib cranes, and solves a difficult problem in a remarkably simple manner. TRAVELLING GOLIATH CRANE at Fiume Dock, Italy, with a span of 219 feet. This crane, which has a capacity of 100 tons, consists of an immense girder supported on steel towers which run on rails at either side of the dock. The girder supports two independent travelling crabs. The far end of the folding lever bears the pulley from which the lifting cable hangs down; the other end is curved to receive non-active guy cables which lead up from the apex of the main revolving framework of the crane. When the jib is raised, the lever automatically folds, thus keeping the lever point pulley at a constant level, and so the load itself traverses a horizontal path. Another important feature of the Babcock and Wilcox level luffing gear is the counterbalancing of the weight of the jib and the folding lever. A counterpoise of some kind is inseparable from any crane of the wharf type to ensure stability of the whole structure when a load is being lifted. The counterpoise used to be fixed, but on the level luffing crane it is linked up with the jib and given a counter-movement. The effect is that the jib, whether loaded or unloaded, can be left in any position without there being any tendency to move inwards or outwards. As the whole combination, therefore, is in a constant state of balance, as care is taken to eliminate friction to the utmost and as the luffing load moves horizontally, so the luffing movement can be conducted at high speed with great safety and at a low expenditure of power. In practice, the hoisting mechanism is often at work during luffing, but the jib-raising gear, that is, the luffing gear, is not called upon to play any part in lifting the load. T his luffing gear has other advantages, including its ability to work in a restricted space. It is applied also to cranes used in construction work, especially in ship-building, where several cranes are required to operate close to one another. CLEARED FOR ACTION, the Stokes breakdown unit is divided. The jib is raised and the bogies are uncoupled from the main carriage, leaving ample working space for the crane. Cranes of this type can lift more than 100 tons at a radius of 20 feet. Large jib cranes comprise a number of different types, the most important of which is the portal crane. This type of crane is mounted on a steel arch whose feet are provided with wheels that run on widely-spaced rails. Through the arch run one, two or even three sets of railway tracks, and clearance is provided for the largest loads capable of being transported by rail. On top of the arch is a revolving platform that carries the main framework of the crane, the jib and the driving cabin that houses the machinery. On the opposite side of the driving cabin is the great balance weight that is moved in or out by levers to counterpoise the jib as it is luffed. The motive power may be steam, hydraulic or internal combustion engines, but electricity, as in other fields of engineering, is playing an increasingly important part in the operation of cranes. In some cranes one side of the arch is dispensed with and the platform is carried on a set of wheels that run on a rail laid on top of the dock sheds. These machines are known as semi-portal cranes. Cranes of the portal or semi-portal type are moved along their tracks by power or by gearing worked by hand. An interesting feature of these cranes, when operated electrically, is the provision of power supply points along the quay. From the cranes there trail long electric cables with massive fittings that plug in in the same way as a domestic iron is plugged in by the housewife. Large jib cranes are built also on steel towers, of varying height, that may be fixed or capable of movement on wheels. Some of these jib cranes are of enormous size and provide an interesting comparison with the humble machines of the country station yard. A giant jib crane is at work in Durban Harbour, South Africa. The crane has been tested to lift a load of 100 tons, and its working capacity is 80 tons with the jib extended to a radius of 62 ft 6-in. In addition to the main hoist there is an auxiliary hoist with a capacity of 20 tons at a radius of 72 ft 6-in. The base framework of the crane is over 20 feet high, 27 feet wide and 33 feet long and is carried on four rails by sixteen wheels, eight of which are driven by a 35-horse-power electric motor. Another 35-horse-power motor is used for slewing, and the crane can be swung in a complete circle in three minutes. The jib is counterbalanced by a swinging balance weight of 123 tons and the luffing motor is of 30 horse-power. Even with this low expenditure of power a luffing speed of 60 feet a minute is attained with a load of 80 tons. A more powerful luffing motor is not required because of the purely horizontal movement of the load and the perfect balancing of the jib, which is fitted also with the folding lever. The highest position of the crane hook above the wharf is 78 feet, and, below wharf level, into the hold of a ship, the hook can be lowered a distance of 45 feet. The main winding barrel is grooved and made of welded mild steel. It is 6 feet in diameter and 11 ft 6-in long. Main and auxiliary hoists are worked by 50-horse-power motors and special electrical interlocking gear is provided to prevent overloading of the crane beyond predetermined limits. Power is supplied at 550 volts (direct current) by a flexible cable 60 feet long. Cranes of the foregoing dimensions are somewhat uncommon for the handling of cargo, but in shipbuilding yards and fitting out berths even larger machines of different types are sometimes used. Such cranes are variously referred to as “Giant”, “Goliath”, “Titan” or “hammer-head” cranes. 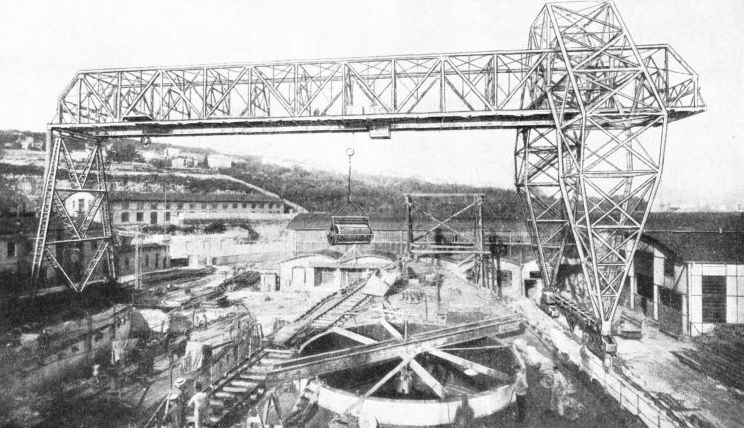 A typical Giant crane consists of a deep lattice girder, sometimes over 150 feet long, mounted near one end on a turntable that surmounts a steel tower. At one end of the girder (or bridge) is an immense counterweight. Near the centre are the machinery room and the driving cabin. Along the projecting arm runs a travelling crab (or there may be two), with a lifting capacity of anything between 50 and 250 tons. A Titan crane is similar to a Giant, but the tower is mounted on wheels and the lifting capacity is generally limited to about 60 tons. It is used as a rule for block setting in the building of harbours and breakwaters. A hammer-head crane, as the name implies, resembles a hammer and may be regarded as a Giant crane on an unusually tall tower. The term “Goliath” refers to a large crane comprising a main girder, with its travelling crabs, supported at either end by a steel tower mounted on wheels. An electric Goliath crane at Fiume Dock, Italy, has a span of 219 feet and a capacity of 100 tons. 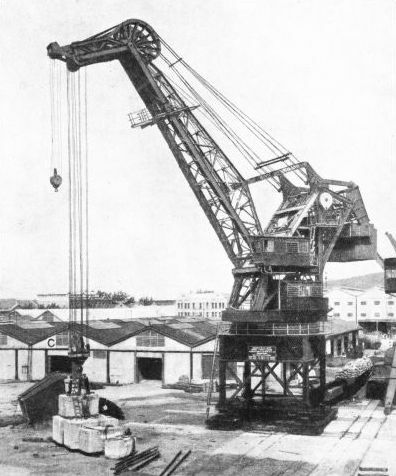 Another type of crane often used in docks is the “sheer-legs” - two enormous masts often over 150 feet high standing with widespread feet on the edge of the wharf and connected at the top so that they form a huge triangle with the wharf as the base. At the junction of the legs is a pulley block. Sometimes the triangle is luffed (or its angle altered) by ropes, but generally there is a third leg in the rear forming, with the other two, the edges of a three-faced pyramid. The sheer-legs are hinged at the lower ends and the rear leg is capable of being moved backwards or forwards so that the upper pulley block is brought “inland” or sent “to sea” at will. It is thus a simple matter to hoist, say, a boiler from the interior of a ship and place it on dry land tor overhaul, repairs or replacement. A 6-TONS LORRY CRANE is a mobile unit which has a wide range of utility in constructional work. Power for operating the crane is supplied by a generator mounted on the chassis. The crane can be controlled from the driver’s cabin or from a duplicate set of controls on the turntable. The other type of crane that finds a place in docks and harbours is the floating crane, which may perhaps be described as a “jib on a raft”. Here again size is the keynote, and floating cranes deal with hoists to a height of 100 feet and more with loads up to 250 tons. The motive power may be steam, diesel or a combination of either with electric transmission. Steam engines and boilers are often fitted in the pontoon for driving the propellers and also a dynamo to supply current to the crane motors. Among the smaller machines are the portable cranes. These may run on rail or road, and are generally driven by steam or internal combustion engines. The contractors' little steam cranes are a familiar sight on excavation work. They comprise a four-wheeled truck on which is mounted a turntable carrying a steam winch, a jib and a vertical boiler that does a double duty in supplying steam to the engine and acting as a counterweight. There are other types of portable, or mobile cranes intended for use on roads or in goods yards, workshops and warehouses. There is one type of mobile crane that most motorists will at once associate with misfortune. Mounted on the back of a lorry, with jib projecting over the tailboard, the mobile motor crane is sent to the scene of an accident. In a brief space of time the crane is at work clearing wreckage and hoisting one end of the damaged vehicle before towing it to the garage. A modern mobile crane for handling goods or manufacturers’ materials comprises a chassis mounted on four or six wheels, or on crawler tracks. The crane is generally of the jib type, mounted on a turntable on the chassis. Power for the crane and for the road wheels is obtained from a diesel-electric power plant. Sometimes the power unit is an internal combustion engine, or the drive may be electric, with current supplied from a battery. Mobile cranes are made in a wide range of types and sizes. 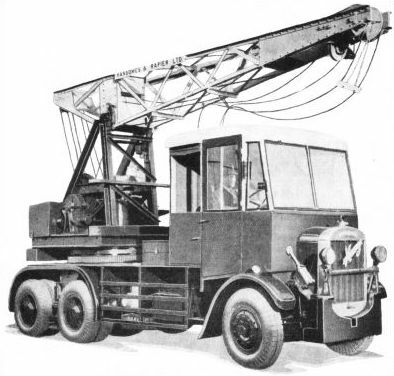 The “Rapier” mobile crane, which can travel on the main roads, is steered as easily as a motor car and capable of going right up to its job. Such cranes are used for many purposes inside and outside goods stations and warehouses, and also at railheads and goods yards, as they are designed to work in all weathers. The large cranes for loads up to 6 tons or more are used principally for handling metal and timber containers. Further, mobile cranes can be taken by road or rail for any distance to function at a goods depot where there may be a rush of work. For short distances by road, the crane's own power can be used; for long distances the cranes can be placed on low platform trucks and sent by rail or by road. Compactness is another important feature because of the many instances where the crane has to travel and manoeuvre in confined spaces and gangways, with restricted head room of roof ties and doorways. Careful thought in designing for various conditions has enabled mobile cranes to be standardized, so that they can be manufactured as a stock product ready for instant delivery. At the other end of the mobile scale are the four- or six-wheeled lorry cranes, with a lifting capacity up to 6 tons. Another specialized type of crane is the railway breakdown crane. 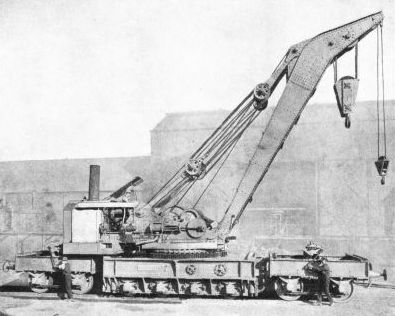 A fine example of this class of crane is the breakdown unit designed and introduced by the late Sir Wilfrid Stokes and built by Ransomes and Rapier, Ltd. A typical “Stokes” unit comprises the main carriage mounted upon four axles. At either end of this carriage a four- or six-wheeled bogie can be coupled for the purpose of distributing the axle loading over a long flexible wheelbase, when the crane is required to travel in a train with its massive jib lowered and supported on a separate truck called a matchtruck. When the crane is cleared for action, the jib is raised and the bogies are quickly detached, thus leaving a short carriage with ample working space at either end. Breakdown cranes are built with lifting capacities of over 100 tons. Yet another type of portable machine is the travelling crane. Here again the range and size and utility are considerable. Travelling cranes are used in workshops for the handling of materials and machinery, in foundries for lifting moulds and patterns, and in power houses and ships’ engine-rooms for lifting turbine cases and other machinery. Large warehouses use overhead travelling cranes for handling merchandise. For handling coal, iron and timber in the open air travelling cranes are used extensively. An overhead travelling crane comprises a bridge provided with wheels at either end. The wheels, driven by electric motors, run on rails laid on gantries attached to the inside walls of a building, or built up on a series of columns in the open air. The crane is provided with a driving cabin generally suspended beneath one end, and hoisting and traversing (moving lengthwise across the bridge) is performed by one or more electric crabs. The span of an electric travelling crane often exceeds 100 feet and hoisting capacities reach 250 tons. The most common termination of a hoisting cable is a hook, but this is of little use for lifting such material as coal. So a grab is substituted - a pair of hinged buckets that are lowered on to the coal heap in an open position. The grab takes a bite on the coal (about one to three tons a minute is a common rate of feeding), and the steel jaws close, carrying their load aloft to be deposited on conveyer belt or truck for transport. Pig iron and scrap iron are also awkward loads to handle with a hook, and for this class of work the hoisting cable is provided with an electro-magnet. The magnet, which may be 4 to 6 feet in diameter, is lowered over a heap of pig iron and the current is switched on. Some five tons of pig iron cling to the magnet and are promptly hoisted and dumped into a railway wagon or other receptacle. The current is then switched off and the magnet returns for another load. Some cranes “drop things” deliberately. A crane with electro-magnet on the end of the cable is used to pick up a huge iron ball which is carried to a great height. The current is switched off and down crashes the ball - but its blows, repeated again and again, are turned to useful account. Beneath the crane is a sea of scrap iron waiting to be broken up for remelting in the blast furnace. THE STOKES RAILWAY BREAKDOWN CRANE, seen here in train order, was designed by the late Sir Wilfrid Stokes. The crane is mounted on a main carriage with four axles. When travelling, the jib is lowered and rests on a four-wheeled bogie. Additional four- or six-wheeled bogies are coupled to the unit to provide linking units between the crane, the jib bogie and the rest of the breakdown train. You can read more on the “Electric Travelling Crane” on this website.